It is that way in the autumn of the year. You hide and don’t open your door because it’s the neighbor offering baskets of their bumper crop of zucchini. Or, you get no answer when you knock on your neighbor’s door with your own basket of zucchini. So, when you have too much zucchini you make zucchini bread, zucchini pickles - try out all the recipes to use up your bounty from the field. 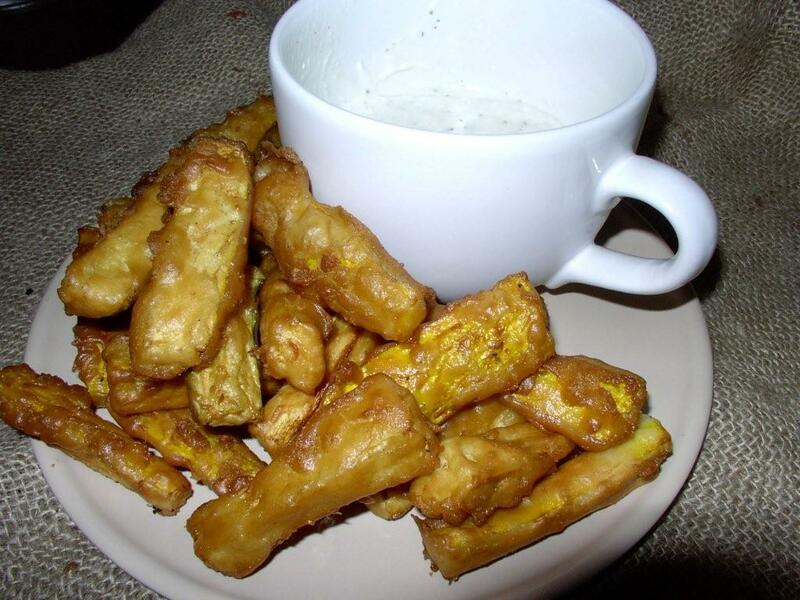 Increasingly one of our favorites has become fried zucchini. Great as a party appetizer, it is actually quite quick and easy to prepare. Those Sunday afternoon sessions at the TV watching the football game scream for fried zucchini to be on the coffee table among the other chips and dips. A lot of people like bleu cheese salad dressing as a dipping sauce for their fried zucchini. Some demand marinara sauce or even honey-mustard sauce. I prefer the tangy nip of ranch-style salad dressing. Either green or yellow zucchini can be used. The yellow has a softer skin. If the green zucchini is older and on the tough side, it would be better to peel them before coating and frying. Deep fried zucchini is usually a finger food. Cut the zucchini in 3-inch lengths. If the skin is tough, you may want to peel the zucchini first. Depending on the size of the zucchini, quarter or cut the 3-inch lengths into 6 pieces - sticks a bit more than twice the size of a pencil. If you are serving the zucchini at a sit down dinner where the guests are forced to use plates and silverware, then by all means, cut the zucchini crosswise and make nice little bite-sized medallions. Place the cornstarch in a plastic bag. Add the zucchini sticks a handful at a time and shake. Knock off any excess cornstarch and place the sticks in a single layer on a rack. A deep fryer is preferred but any heavy-walled pot will do. Heat your oil to 365 degrees. Be careful when you have all that hot oil on the stove. While your oil is heating, place the remaining dry ingredients in s large bowl and mix well. Slowly add the ginger ale while stirring until you have a slightly thick and smooth batter. Toss a handful of the cornstarch coated sticks in the batter and stir to evenly coat. Use tongs or a fork to transfer the batter coated sticks to a rack and allow any excess batter to drain. Picking up the batter coated sticks with your fingers will wipe away the batter. When the oil is hot and the sticks have stopped dripping, use tongs or a fork to add the sticks to the hot oil. Don’t overload the fryer. The sticks will sink when they are first added but will float to the surface when the batter bubbles up. Fry until nicely browned and crispy - about 3 to 5 minutes. Remove the cooked sticks from oil to a draining rack. Repeat for remaining battered sticks - you’ll have to hurry though, to keep up with the demand. Put your waiting audience to work and have them prepare the dipping sauces. Tempura batter mixes work very well for this dish. I usually don’t have tempura batter mix in the cupboard but I almost always have pancake mix so by default it has become the batter of choice. Enjoy the bounty of your (our your neighbor's) garden.